We’re back in the states and experiencing less culture shock than anticipated. We arrived in San Francisco where we’ll spend a few weeks with the lovely Leah Wolfe (Nate’s sister, my good friend, and our match maker) who’s big smile and palpable energy greeted us at the airport. 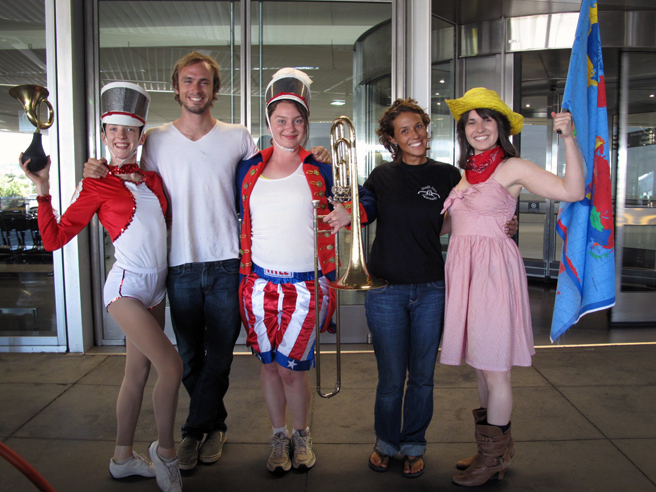 To our surprise, as we exited the terminal, a hula-hooping trombone player, a dancer with a horn and a cowgirl waving a map of the world as a flag, began dancing and playing, I don’t even know what, something American. We stood in amazement as they finished their performance, yelled “Welcome to America! !” and walked away. “You’ve never seen everything,” noted the security guard as we met the red-white-and-blue-clad crew and thanked them for their spirit. A big thanks to Leah, who’s vast spectrum of friends includes girls attending circus school who will travel out to the airport to put on the smallest of shows. Talk about the most amazing welcome home ever. Before leaving SFO, we picked up our friend Phil, who flew in from Salt Lake City — the four of us will be camping and exploring various places down Highway 1 this week. Before we settle down and get jobs Nate and I will be doing a bit of adventuring in the states, so stay tuned to the blog for a bit of Americana travel writing and photos. It must feel bizarre being back in the states after 7 months in SE Asia. I’m quite jealous of you two. So jealous, in fact, you’ve inspired me to go on my own SE Asian adventure next summer for about a month or so. You guys have an awesome blog, as I’m sure you already know:) It’s helpful, informative, and there never seems to be a dull moment. Having travelled the states myself before starting college, I thought I’d chip in some suggestions of places to visit. The entire coast down Hwy 1 is just crazy remarkable. It was much foggier than I’d expected though. Since you’re back in America where everything is bigger and badder, you should check out Hearst Castle near San Simeon. The scale and decadence is just mind blowing. It was probably one of my favorite places I visited. I also highly recommend the Big Horn mountains. Standing on top of the mountains without a spec of civilization in sight (beacuse though the road is below the visibility line of the mountain) is a singular experience, to be sure. And if you’re into architecture, or even if you’re not, Fallingwater in Pennsylvania is definitely worth a look see. It isn’t your normal tourist trap of a place. Everyone there was well mannered and respectful, the guides were very knowledgeable, and the house itself is something to behold. There’s a reason it was voted the best all time work of architecture in America. Welcome back!!! What an amazing reception! Alex, thanks so much for the recommendations! We’ve been doing day trips from San Fran up and down hwy 1 — so amazing! Let me know how your SEA adventure goes!